Hello foodies! Pina Colada Bread Pudding… It just sounds rich and decadent doesn’t it! 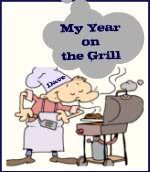 Oh, BTW, Dave here from MY YEAR ON THE GRILL. The resident cook in training that you may recognize from OUR KRAZY KITCHEN. 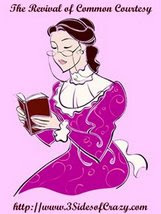 Today is an exciting day for me, and Tamy has agreed to let me do a guest spot on her blog in honor of my special day. You see, the suburbs of Kansas City is hip and happening in a far out way, last night, my neighborhood celebrated “Mardi Gras in the Cul de Sac”! Counting drinks, 13 menu items, to feed 10 people… Laissez les bons temps rouler indeed! I got to spend the day cooking, have fun with my friends, and my proposal to take part in the 24,24,24 FOODBUZZ challenge was accepted. I want to thank Tamy for letting me make an extra post to her readers to tell you all about an amazing CAJUN inspired dessert, perfect for your Mardi Gras party, or if the gods are in alignment, perfect for your Superbowl party featuring the New Orleans SAINTS (as I write this, the Saints are one game away from a birth in the big game)! THE NEW ORLEANS SCHOOL OF COOKING is the best bargain in town. 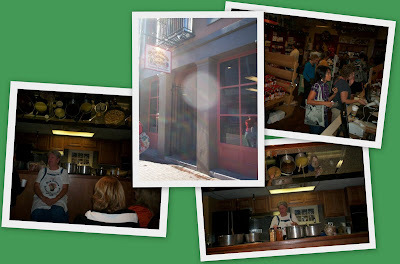 For three hours, you learn the history of the city, you get fed lunch and you learn to cook a complete three course Cajun/Creole meal. We were in town for 5 days, and we took three classes, each day learning different menus. Every one’s favorite was bread pudding. This took just a bit of advance planning. Stale bread works best for bread pudding. the more moisture in the bread, the less it is able to absorb the liquid ingredients. The more the bread absorbs the liquid, the more custard like your pudding will be. So, 4 days ago, I baked a loaf of french bread, just so I could leave it out to get stale. You can read about my bread baking experience by clicking HERE. Combine all the ingredients in a greased 9X12 casserole dish. Mixture should be very moist, but not soupy. Bake at 350 degree oven for @1 hour 15 minutes until top is golden brown. Serve warm with whiskey sauce. Cream butter and sugar over medium heat til all the butter is absorbed. Remove from heat and blend in egg yolk. Add bourbon to your taste, stirring constantly. The sauce will thicken as it cools. Pour this over the bread pudding and serve everything warm. If you should be lucky enough to have any leftovers, pop a slice into the microwave for about 30 seconds and it is even better the next day! We also served a Cream Cheese King Cake for the party, but that’s a story for another posting. The cake was just as good as it sounds. Sweet, filled with custard and different textures, from the crusty bread on the top, the soft custard bread inside and the crunchy pecans, with hints of pineapple, coconut and white chocolate in every bite. And the whiskey sauce doesn’t hurt either! So, thanks Tamy for letting me hangout with your friends today. Start planning your Superbowl party or Mardi Gras event today. This Pudding Cake will be welcome at either! BTW, if you would like to learn more about the NO School of Cooking, you can read my blog post about the school by clicking HERE. Come take a look at my site today. I will have plenty to post about all the different foods… Everything that worked great (and maybe a couple that I need to revisit later). 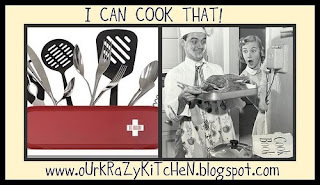 And see you all Thursday over at OUR KRAZY KITCHEN! Dave here from MY YEAR ON THE GRILL. ..
Michelle over at Scribbit A blog about Motherhood in Alaska is doing a series on places to visit and attractions while you’re there. I wrote a guest post for her on the Upper Peninsula that will run today. Go check it out.